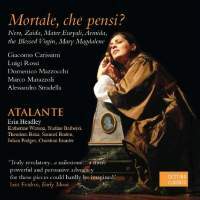 A discerning reviewer gave the first volume of this series by Erin Headley's ensemble Atalante an IRR Outstanding award in April 2012, praising its interesting repertory ‑mid‑seventeenth‑century Italian laments by various composers ‑ fascinating instrumental textures and ravishing singing. The lament was a favoured form of composition in the generations from Monteverdi (who practically invented the genre) to Purcell (who wrote perhaps the most famous in Dido and Aeneas). Historical, literary, religious, and even contemporary figures were made the subject of such laments. On this edition, the Virgin Mary, Mary Magdalene, two different Muslim women and the Emperor Nero appear ‑though Nero's song, composed by Alessandro Stradella, is less a lament than a protracted gloat as he watches Rome burn. Many of the texts were written by members of the noble and nepotistic Barberini family and their circle. Throughout the series may be heard the distinctive sound of the lirone, a Renaissance string instrument that had a brief golden age in seventeenth‑century Italy. Headley is its leading modern exponent. keep using this singer. If all the voices and instruments had incessant vibrato, that would at least have the virtue of consistency ‑ however wrong ‑ headed in every other way. I promise not to dwell much longer on this bugbear of mine, for there is otherwise much to praise about the new recording. Still, I must urge those who think I am being needlessly carping about poor Katherine Watson to listen to the chorus sections in track 7, where her vocal wobble quite unbalances the ensemble, or to compare her clumsy, unstylish singing in several solo tracks with those (too few) sung by Balbeisi with her usual sensitivity and sophistication. All the other singers have timbres and techniques much closer to Balbeisi than Watson. The sepulchral bass, Christian Immler (whom some of us will remember as a Tölzer boy alto), does gallant work with the protracted Nerone piece, 'L'Incendio di Roma', but it really does outstay its welcome long before its ten minutes have expired. Not so Marazzoli's Lamento d’Armida, the only solo piece allocated to the silky Baka, which she sings with spellbinding intensity. Of the two tenors, Julian Podger is better known, but it is the young English singer Samuel Boden who is allocated the lovely anonymous setting of Cardinal Antonio Barberini's A piè del sanguinoso tronco. I had not encountered Boden before, but his refined singing and dramatically alert performance (as the Virgin Mary!) mark him as a singer to watch. As ever with Atalante, the instrumental contribution is rich, sonorous and uniformly well played. 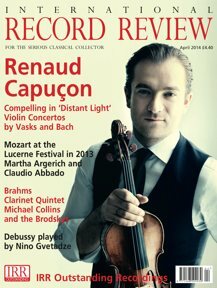 Alongside the gentle buzz of the lirone, can be heard viols of various sizes, harpsichord, chitarrone, double harp and violin ‑ the effect is sumptuous throughout. Headley contributes two highly informative essays and the booklet includes full texts and translations by the singer and scholar Candace Smith. The crystal‑clear recording was made far from the Barberinis' Baroque palaces in the handsomely austere late‑Georgian church of St John at Hackney. With my one major reservation, this is another revelatory and inspiring release by Erin Headley, and Atalante.